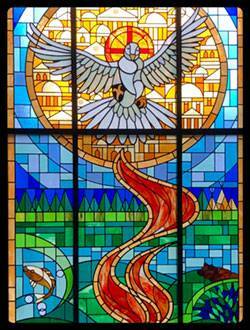 Holy Spirit in the Boundary Waters Canoe Area Wilderness, First Presbyterian Church of Ely, Minnesota, Sanctuary. There are a thousand things I love about Kenilworth Union Church, but from the very beginning, this was at the top of my list: Wilderness Confirmation. Not all churches think outside the box when it comes to Confirmation, but Kenilworth Union does. When youth sports and other Sunday morning commitments were getting in the way of Confirmation being a priority, the church didn’t just say, “Okay, we’re okay with you missing out on this community of people who are doing good and loving God.” This church said, “Okay, how do we welcome you?” “How do we find ways for you to be included in the action?” Wilderness Confirmation is one more way that Kenilworth Union meets people where they are.